FEATURES * Out side air speed measurement. * 0.9 to 35.0 m/s, ft/min., km/h. knots. * All in one, hand held type. * Cup type probe, high reliability. * LCD display, Record ( max., min. ). * Data logger. * Water resistance, heavy duty. * DC 1.5V battery ( UM-4, AAA ) x 4. FEATURES * Cup vane anemometer, available for wind speed measurement, high reliability. * Measurement range : 0.9 to 35.0 m/s * Wind speed unit : m/s, km/h, ft/min, knot, mile/h. * ℃, ℉ temperature measurement. * LCD display, IP 65 water resistance. * Microprocessor circuit ensures high accuracy and provides special functions and features. * Records Maximum and Minimum readings with recall. * Data hold and 100 point data logger with recall. * Auto power off saves battery life. * Operates from DC 1.5V ( UM4/AAA ) x 4 PCs batteries. FEATURES * Cup Anemometer, Barometer, Humidity, Temperature meter, 4 in one, professional. * Anemometer unit : m/S, Km/h, FPM, mph, Knot. * Barometer unit : hPa, mmHg, inHg. * Humidity with Dew point measurement * Temperature measurement with ℃, ℉ unit. * Cup vane anemometer, available for wind speed measurement, high reliability. * Fast response time for humidity measurement. * Atmosphere measurement with high accuracy. * Two display can select the six mode ( function ) :Humidity/Temp., Humidity/Dew point, Anemometer/Temp., Barometer/Temp. 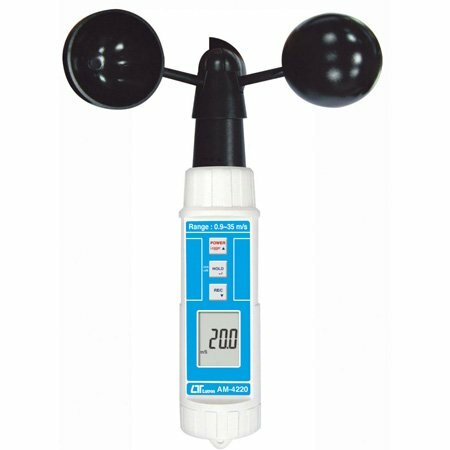 Barometer/Humidity, Barometer/Anemometer, * Bright LCD display. * Microprocessor circuit ensures high accuracy and provides special functions and features. * Records Maximum and Minimum readings with recall. * Auto power off saves battery life. * Operates from DC 1.5V ( UM4/AAA ) x 4 PCs batteries.